John Guest Quick Connect Fittings simple and easy to use connections for water filters. 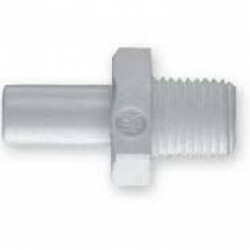 Reducing Straight Stem Connector White - 3/8" Stem Speedfit x 1/4" Male NPTF. Suitable for all High Qulity Water Purification Systems, Filtration Systems. 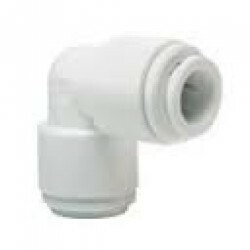 Part Number: CI051222W Made in UK..
John Guest Quick Connect Fittings simple and easy to use connections for water filters. 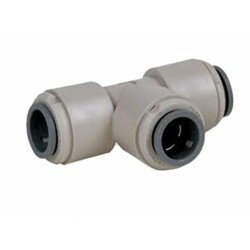 Polyproylene Equal Elbow Connector White - 3/8" Tube Speedfit x 3/8" Tube Speedfit. Suitable for all High Qulity Water Purification Systems, Filtration Systems. Part Number: CI0312W Made i..
John Guest Quick Connect Fittings simple and easy to use connections for water filters. 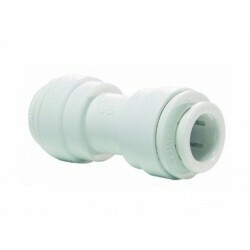 Polyproylene Equal Straight Connector White - 3/8" Tube Speedfit x 3/8" Tube Speedfit. Suitable for all High Qulity Water Purification Systems, Filtration Systems. 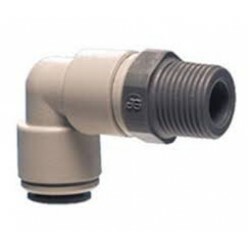 Part Number: CI0412W Mad..
John Guest Quick Connect Fittings simple and easy to use connections for water filters. 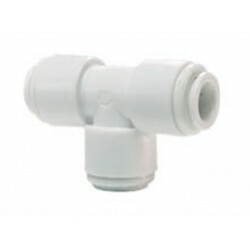 Polyproylene Rigid Equal Tee Piece White - 3/8" Speedfit x 3/8" Speedfit x 3/8" Speedfit. Suitable for all High Qulity Water Purification Systems, Filtration Systems. Part Number: CI0212W Made in..
John Guest Quick Connect Fittings simple and easy to use connections for water filters. Polyproylene Rigid Equal Tee Piece White - 3/8" Speedfit x 3/8" Speedfit x 3/8" Speedfit. Suitable for all High Qulity Water Purification Systems, Filtration Systems. Part Number: PI0212S	Made in UK by J..
John Guest Quick Connect Fittings simple and easy to use connections for water filters. l Reducing Straight Connector - 3/8" Speedfit x 1/2" Speedfit. Suitable for all High Qulity Water Purification Systems, Filtration Systems. 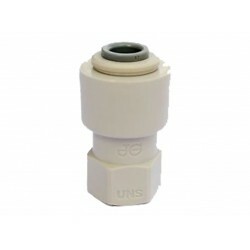 Part Number: PP201612W Made in UK by John Gues..
John Guest Quick Connect Fittings simple and easy to use connections for water filters. 3/8" Tube Speedfit x 1/4" NPTF Male Thread Swivel Elbow Suitable for all High Qulity Water Purification Systems, Filtration Systems. Part Number: PI091222S Made in UK by John Gues..
John Guest Quick Connect Fittings simple and easy to use connections for water filters. 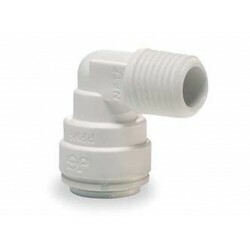 Polyproylene Equal Straight Connector White - 3/8" Tube Speedfit x 3/8" BSP Female Thread Suitable for all High Qulity Water Purification Systems, Filtration Systems. 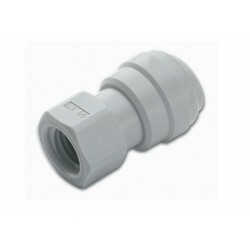 Part Number: PI451213S ..
John Guest Quick Connect Fittings simple and easy to use connections for water filters. Polyproylene Rigid Equal Tee Piece White - 3/8" Speedfit x 3/8" Speedfit x 1/4" Speedfit. Suitable for all High Qulity Water Purification Systems, Filtration Systems. Part Number: PP30121208W Mad..
John Guest Quick Connect Fittings simple and easy to use connections for water filters. 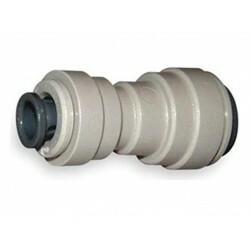 Polyproylene Rigid Elbow Grey - 3/8" Tube x 7/16" - 24 UNS Tap Adaptor. Suitable for all Water Purification, Filtration Systems. Part Number: CI3212U7S. Made in UK by John Guest. ..
John Guest Quick Connect Fittings simple and easy to use connections for water filters. 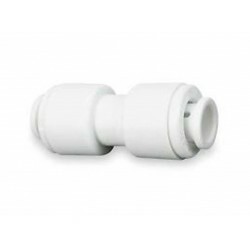 Polyproylene Rigid Elbow White - 1/4" Male NPT Thread x Tube 3/8" (NPTF Thread x Speedfit 1/4") Suitable for all Water Purification, Filtration Systems. Part Number: CI481222W Made in UK ..